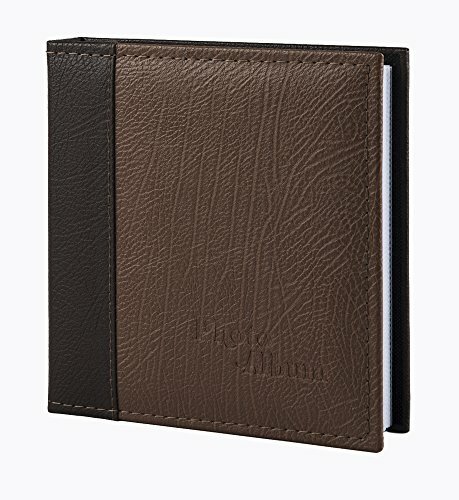 This brown leatherette cover album holds 80 photos in optically clear pockets vertically. Photos are displayed two per page. The album is book bound with a sturdy rounded spine and measures 9x8.5x1.5". Photo Safe: Acid, lignin, and PVC free. Size:Cover 9x8.5x1.5", Photo 5x7" for slots. Inside:40 white non-weaven sheets,holds 80 photos,1 per page vertically. Display:Put photos vertically into the slots. Characteristic:Photo slip-in pp pocket individually. If you have any questions about this product by FaCraft, contact us by completing and submitting the form below. If you are looking for a specif part number, please include it with your message.